I’ve put a lot of thought into writing this blog post and it wasn’t a very easy decision. On one hand, I would like to inform as many people as possible about the situation, and on the other hand I have troubles deciding if I should inform more people about this. Why? It’s simple: more tourists in the area, means less chances of survival for the turtles. Considering this, for conservation reasons, I will name the location: Big S.
Big S is home of a quite large Marine Park which means turtles can be spotted. When I first got there, I had no idea you can spot so many beautiful marine animals and this is what made the surprise even bigger. Fascinating little creatures… Simply stunning! I went slowly from enjoying my vacation, to realizing I ended up in the middle of a disaster area for the local wildlife, which will slowly lead to the extinction of turtles. The Marine Park is quite unusual, because the bay in which it’s located is home of hundreds of stores, bars and restaurants, all projecting into the sea bright colorful lights and loud noises, spooking out the turtles. Besides this, motor boats and ships full of tourists scan the area for the wonders of the Sea, injuring the animals with the propellers. To make matters worse, the tourists step on the turtle nests and destroy the eggs. What also doesn’t help are the water sports which led to the injuring and death of a large number of turtles, in the past year. Not quite the habitat for a turtle? You are perfectly right! This is why NGOs started working on the protection of these fascinating creatures. Switching from vacation mood to all hands on deck mode, I became a volunteer for a few days, helping a marine biologist in the fight for raising awareness of the impact of tourism on the beautiful animals. Difficult mission though and it will always be this way as long as the financial interests of the locals get into conflict with the marine wildlife. This started a lot of conflicts between locals who want to keep their business at any cost and people who want to protect the animals. Marine Park guards got harassed by locals and tourists who simply don’t want to leave the beach when the turtles are nesting, and protectors got harassed for endangering the local tourism. Very sad story, especially when you know the turtles stand no chance when it comes down to what’s more important for the local economy. A Marine Park doesn’t make money, but a restaurant or club does. What’s even more sad is that Big S has a similar story, when the wildlife lost the battle. Not long ago the habitat of the flamingo birds, which used to call Big S their home, got destroyed and replaced with concrete structures, and now, because of the increase in the number of tourists, the turtles are endangered as well. The main problem is that tourists are not informed about the location of the nests and the dangers of the vibrations caused by walking close to the area. Curiosity brings people closer and closer, until they end up suffocating the hatchlings. Also, following them into the sea, or chasing them with speed boats, causes a lot of stress on the turtles, and sometimes they end up injured or even worse, dead. Beautiful Big S is definitely worth seeing, but in such location, with a rich turtle population, you have to consider the marine wildlife and don’t become part of the problem! The main reason for writing this article is to raise awareness on the turtles, as conservation of all species is very important. Animals were there long before us, so think twice before renting a speed boat or practicing water sports, in any location where you know marine creatures are present. Also, keep your distance from the nesting beaches, as you might step on a nest without even realizing it, and kill the hatchlings. 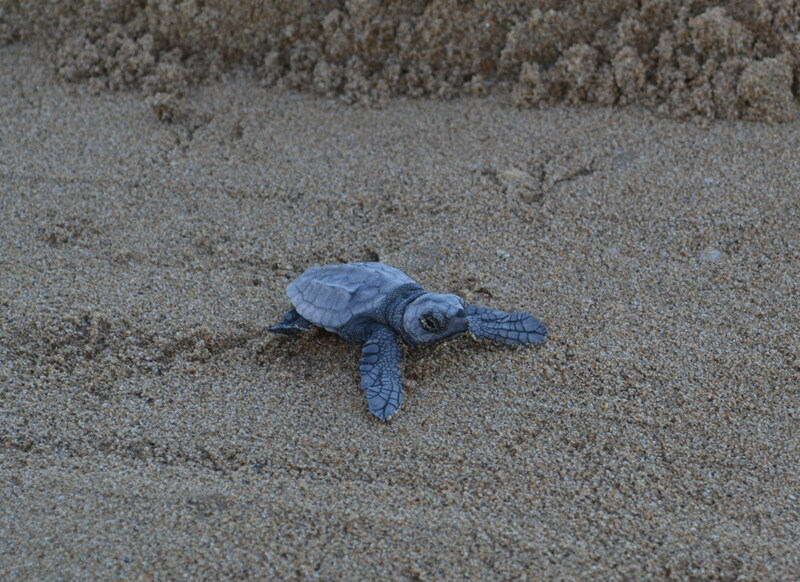 Considering that only 1 in 1000 hatchlings reaches mating age, every turtle is precious! This entry was posted in Animals and Nature, Volunteering, Wildlife and tagged bay, conservation, endangered, extinction, hatchlings, marine park, nest, NGO, travel, turtle by Lucy. Bookmark the permalink. Unfortunately, the world is always thinking about money first before anything else. It’s part of the human makeup for survival. Everything else comes after. Really sad that greed is the number one factor of importance in the world. It has been that way in the past, is at present and will be in the future until the world ends. But there are so many good people (angels I call them) that sacrifice so much to help our four legged species. May they have a special place in heaven for caring for all of God’s creatures. Your thoughts are on the right track, Lucy. If this world continues on the path that it is going with what is happening slowly to this earth, yes, there will be an empty planet…and a no planet. Scientists have and are predicting a crisis if nothing is done to prevent it. Did you have a climate change march in your country?. Now, that is human awareness working and now it is up to those that are attributing to it to reduce what is causing this change in the atmosphere. At your age, you still have a life time to live and it is important as you are to be very concern about it. Being an activist for the well being of all mankind, our environment and everything living on this earth is a must in order to keep this beautiful earth alive and well. It’s a treasure given to us and as humans we have a responsibility in taking good care of it. Thank you…Thumbs up to you. Lucy. I think you will be a great asset to care about and contribute awareness where it is needed most. I am blessed to be at part of your circle of friends and want you to know I will be until I am too old to type! You can always can count on me….. Hugs!! Reblogged this on fur heaven.